Our country-wide Annual Meeting this year will take place at the Hotel d'Angleterre, downtown Geneva. 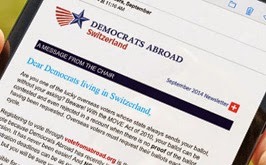 All members are encouraged to attend and support Democrats Abroad Switzerland as it organizes for 2015 and the 2016 presidential elections. We encourage members from Basel, Bern, Zurich, Lugano and further to come for the day or weekend: homestays with local members • Saturday AM walking tour of Geneva • dinner gatherings on Friday or Saturday night (sans host). However you plan to participate please email us at events@democrats.ch with the details requested above. We need to have a count to set up the meeting room. 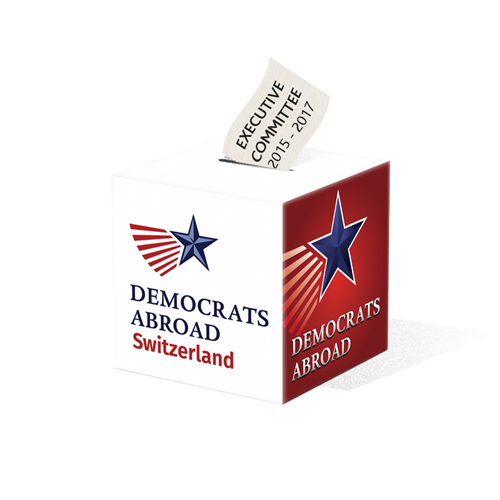 Elections for the Executive Committee of Democrats Abroad Switzerland will be taking place during its annual general meeting on Saturday 14 March at the Hotel d’Angleterre in Geneva (see above for details). This yearly meeting is for you, and your votes will elect the nominations brought from the floor. Maybe you would like to join the Committee! As an added incentive we will present and discuss "Citizen’s United and the American Political Landscape", a subject we are all concerned about. If we don’t have paid staff, how do we ensure things get done? DA-Switzerland, DA International and all its other country committees are 100% volunteer organizations. We really do need help – on the local-chapter, national and international levels. As a volunteer organization, we depend entirely on our members to accomplish our goals. It's Committee members who imagine new ways to reach out to all those Americans in Switzerland. So not only is your participation really important to us, but any hours you donate make it possible to: set up and man voter registration tables where Americans meet, create buzz on our social media channels, organize American-community events, or run phone banks before elections. We wouldn’t even have monthly meetings without you. If you have a few hours a month that you can spare, and if you want to help us get ready for the 2016 Presidential Elections, please stand for a Member-at-Large position on Saturday, or simply get in touch with us. We’ll find the perfect job for you! :-). We share with you President Obama's speech at the bridge in Selma, AL, on the 50th anniversary of the March 1965 Selma-to-Montgomery voting-rights protest marches. These high-profile protests were a racial-justice turning point, and helped lead to the historic 1965 Voting Rights Act. American Uni students, grad students or any young Democrats: Join us Wednesday at new Geneva tapas bar "La Fabrique", easy walk from UNIG. Write Emma Clarke for info or to RSVP. Private guided tour of art galleries before Thursday evening's public La Nuit des Bains. Mamco art historian and curator Samuel Gross will guide you through his choice of current exhibits, over 1.5 hrs. Meet at gallery Truth and Consequences. Followed by dinner at local restaurant. This tour is a fundraiser for Democrats Abroad Switzerland. Donation: Chf 80/adult, 140/couple; optional dinner 50/person. Spaces limited, reply early to: events@democrats.ch. DACH is part of Democrats Abroad, representing U.S. citizens living outside the states in the Democratic Party.